This Thursday the s*n will launch a world cup charm offensive. It plans to deliver 22 million free copies to households all over England. They have decided not to include one city in the mail shot. Guess which one. Perhaps they thought the sight of mass burnings on Merseyside would prove counter-productive. Liverpool is a leftward leaning city. Of course I wouldn’t want to lump all of it’s citizens into one political pigeon hole. After all there must be the odd Tory in the city (just not enough to elect any Conservative councillors). 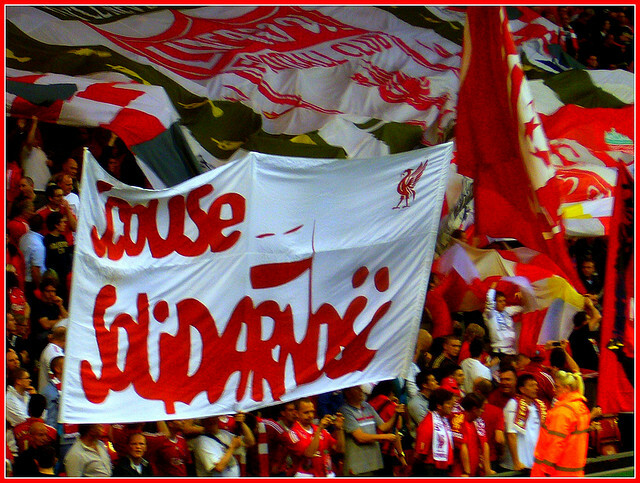 The root of Liverpool’s “socialism” (small ‘s’) lies in its strong sense of community and togetherness. In short, if you take on one of us, you take on all of us. The more poetic Liverpudlians among you might say “an injury to one is an injury to all.” It amounts to the same thing. Every attempt to undermine the city, or besmirch it’s reputation has only served to drive it’s people closer together. Nothing symbolises this fact better than Liverpool’s response to the s*n newspapers infamous headline “The Truth”. For most of us the thought of mentioning that rag in the same breath as the word truth, bordered on the ridiculous long before 1989. That said, we could never have imagined the depths to which that paper sank after Hillsborough. Just four days after Hillsborough! Let’s be clear here. That headline orchestrated by Kelvin McKenzie was no mistake. He knew exactly what he was doing. In the hours that followed the disaster a cover story was hatched by South Yorkshire Police and their cronies in the press. It was a lie that would persist for decades. The s*n, and specifically McKenzie were in the vanguard. There may have been a time when the less educated would have branded such statements as paranoid and overblown. The Leveson and Hillsborough Independent Panel reports have since put paid to any such suggestions. Now the whole country knows what we knew thirty years ago. McKenzie did make a mistake in constructing that headline though. He took on the city of Liverpool and Merseyside. Can anyone remember a more solid and relentless boycott than the one this city has inflicted upon the s*n? For twenty five years people have refused to by it. Many newsagents won’t even stock it. Now postal workers are refusing to deliver it. I remember, along with many others going into local shops and asking them to put up the posters in their window. I think the words went along the lines of “In solidarity with our brothers and sisters who died in Sheffield, Don’t buy the S*n.” It took hold fast and the paper has never recovered. This is illustrated beautifully by the stunning response of postal workers in Lancashire. In refusing to handle the paper, they have ensured that no homes in their area will receive it. Needless to say their campaign received widespread support. Let’s put this into perspective. I have grown older and greyer. I have married, had kids, divorced, got married again and had more kids and still the boycott remains solid. This is a fight that spans generations. My eldest wasn’t born in’89. He’s eighteen now and he will never buy it. Neither will my youngest. More importantly they know exactly why they won’t buy it. 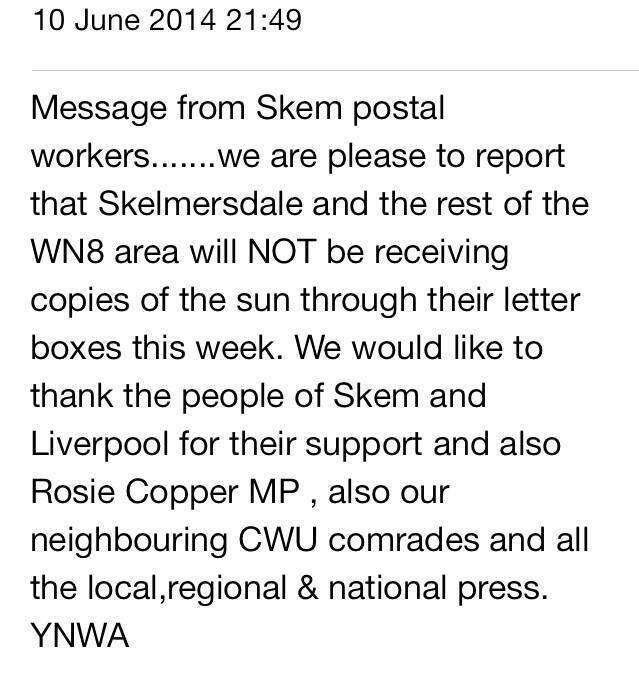 The s*n thought that by omitting Liverpool postcodes from their mail drop they would escape a backlash. Another disastrous miscalculation on their part. Hillsborough touched countless families across Mersey borders and beyond. The actions of postal workers who deliver to Lancashire post codes, illustrates this point brilliantly. Members of the Communication Workers Union at the Skelmersdale Royal Mail sorting office are refusing to deliver the rag. They have threatened to strike if their manager’s attempt to force them.